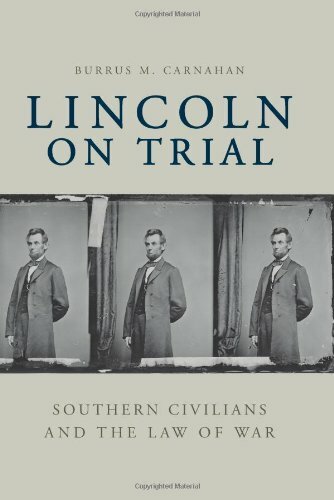 [PDF] Lincoln on Trial: Southern Civilians and the Law of War | Free eBooks Download - EBOOKEE! Description: Product Description: In light of recent controversies and legal actions related to America's treatment of enemy prisoners in the Middle East and Guantanamo Bay, the regulation of government during wartime has become a volatile issue on the global scene. By today's standards, Lincoln's adherence to the laws of war could be considered questionable, and his critics, past and present, have not hesitated to charge that he was a war criminal. In Lincoln on Trial: Southern Civilians and the Law of War, Burrus M. Carnahan conducts an extensive analysis of Lincoln's leadership throughout the Civil War as he struggled to balance his own humanity against the demands of his generals. Carnahan specifically scrutinizes Lincoln's conduct toward Southerners in light of the international legal standards of his time as the president wrestled with issues that included bombardment of cities, collateral damage to civilians, seizure and destruction of property, forced relocation, and the slaughter of hostages. Carnahan investigates a wide range of historical materials from accounts of the Dahlgren raid to the voices of Southern civilians who bore the brunt of extensive wartime destruction. Through analysis of both historic and modern standards of behavior in times of war, a sobering yet sympathetic portrait of one of America's most revered presidents emerges. No comments for "[PDF] Lincoln on Trial: Southern Civilians and the Law of War".